After seeing Cee’s Halloween Doors last week I really wanted to make time to get out to find and photograph a few of my own for this week. 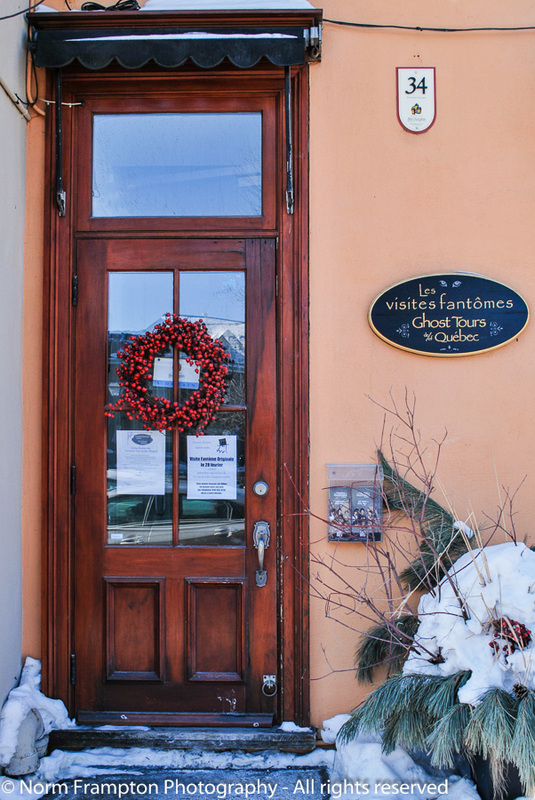 Despite my good intentions I just wasn’t able to make it happen, so instead I offer you this door from Quebec City which is the entrance to a local walking tour company. Ghost tours are not unusual; you’ll find them in many cities. They help bring local history to life and they’re certainly a novel way to attract curious tourists. I suspect that with Halloween upcoming, these folks will be in for a very busy weekend. This entry was posted in Photography, Thursday Doors and tagged Blogging, Canada, Doors, Ghost tours, Halloween, Historic Buildings, Photography, Quebec City, Thursday Doors, Tourism, Vieux Quebec, Walking Tours. Bookmark the permalink. Nice one. BTW you can always just save it for the next week. I must go on one of those ghost tours there is one in Cambridge so will have to put it on my to do list…. Absolutely! I think you’ll find it a novel way to link back to the history of the community. I’ve been on a few Ghost/Cemetery tours and have always found them very educational. We have our own ghost near where I live, and a month long festival, https://coveyview.wordpress.com/2014/10/31/the-bells-witch/. I enjoy visits to places like Charlotte, NC, New Orleans, that show off their ghost and feature beautiful and unusual architecture such as the beautiful door featured in your blog. Nice old architecture, ghosts, and cool doors; sounds like a winning combination to me. Thanks, I kinda like the rich colour of the wood on this one myself. Aww thanks:) yes I did, and potpourri and baby clothes, and striped cats with dresses. A very interesting door, Norm, I love the colour of the wood. Do you have snow already? It will be at least another month, hopefully longer. This pic is from last winter. Thanks. I’m not in a rush but I guess the Christmas decorations will be up everywhere soon enough. The concept is getting quite popular. Ghost doors are very appropriate. I actually posted a gate. Happy Halloween! Is that snow I see?? The horror!! Beautiful old door, though! I love this photo. Once more your post reminds me of a wonderful experience from my past. When I was in Quebec about fifteen years ago, I took at least fifty photos of different doors. I had never done that before and I have not done it since, but the doors in Quebec were so fantastic. All these doors were pre-digital and I recently found them when I was cleaning up my spare room. I had totally forgotten about them. Thanks for the kind words. Must have made for some nice memories to find those pics. I’m sure you photographed a lot of the same doors as me. This is a handsome door Norm. The snow is a not so welcome reminder of what season is in the on-deck circle but I like the picture a lot. Thanks Dan. Yeah this pic was from last winter and I hesitated to post it mostly because I’m not ready to look at snow yet either. I think I somehow missed making last week’s rounds of Thursday Doors, Norm. Busy st work and little sputtering of effort after working 10 hour days. I will travel back in time to see last week’s posts. . . Thanks – Though I’m not looking forward to the months of colder weather still to come. You know you’re welcome to join us whenever your schedule allows it and the mood strikes you.